Like many local youngsters, Jerry Chilvers at age 8 was in the city sponsored Sea Cub program. In the early 1960s, Chilvers hung around the beach watching the lifeguards. 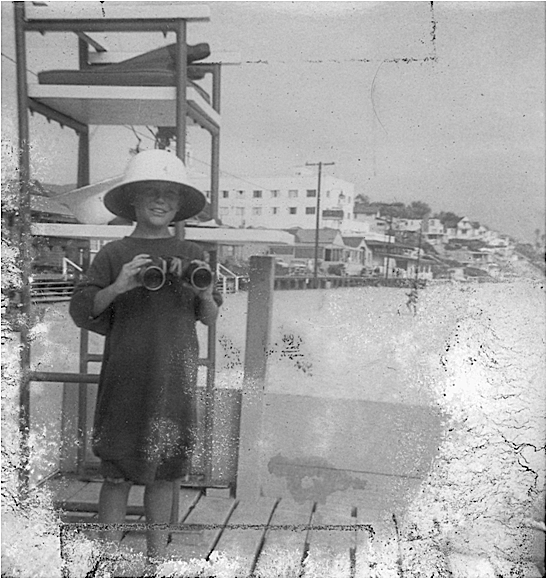 Jerry Chilvers as a child on Main Beach. “He enjoyed being with lifeguards and we all loved him,” said Dale Ghere, a veteran Laguna Beach guard who Chilvers called a “role model.” “Jerry came early and stayed late,” recalled Ghere. Chilvers, now 60, described learning beach safety with practice rescue drills involving a Clorox bottle tied to a rope. Other lessons learned included recognizing rip tides and, as the cubs progressed to junior lifeguard classes at age 13, mouth to mouth resuscitation and basic first aid. Basic first aid, reinforced later during an eight year Army enlistment, saved Chilvers life in February when he nearly severed his hand in a saw while working alone at a San Clemente job site. Unable to dial his phone and not finding any neighbors at home, Chilvers made it 30 yards to the nearest through street, holding the barely attached hand onto his arm. He knew he was losing a lot of blood quickly and risked passing out. He was fortunate to flag down a passing car driven by Steve Gesiriech, a retired Edison electrician, by wagging his foot. “I could see he was holding his hand and there was a lot blood everywhere,” said Gesiriech, 61, who pulled to the side of the road and turned on his emergency flashers. “I was in shock, but Jerry was calm,” the good Samaritan said. Chilvers instructed him to hand over his belt to use as a tourniquet and asked him to dial 911 and provide their location. “It was the first time I’d had to be the first responder,” said Gesiriech, who took over keeping Chilvers’ hand attached to his arm. “I didn’t know what else to do,” he added. When the paramedics arrived the tourniquet was doing its job. “Once they got a closer look at the hand they started moving faster,” Gesiriech said. Chilvers with his surgeon, Dr. Mark Elzik. Chilvers was transported to the trauma center of Mission Hospital in Mission Viejo. 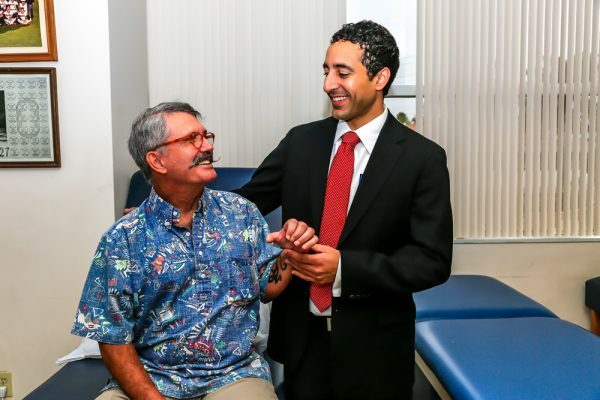 Over a nine-hour surgery, Dr. Mark Elzik, an orthopedic surgeon and hand specialist, aligned bones, tendons, nerves and blood vessels using pins, wires and sutures, says a statement from the hospital. Early treatment in the intensive care unit included placing leeches on the tips of Chilvers’ fingers to take advantage of the anticoagulant they secrete that reduces blood clots and improves circulation. The therapy worked and within days blood flow was restored to the hand, indicating the surgery was successful, the statement says. Even months after the accident, Chilvers still requires daily physical therapy. He has feeling in his fingertips and is working toward being able to grab an object. He’s told it will take a long time. “God was watching over me that day; everything fell into place,” said Chilvers, of Mission Viejo, who returned last year to Orange County after 30 years in the construction business in Germany. The Laguna Beach High School graduate recalled attending city council meetings at age 13 to advocate for a lifeguard tower. He credits Laguna Beach lifeguards John Cunningham, La Vern Dugger, Dean Westgard and Craig Lockwood for teaching him life lessons, respect for the ocean and lifesaving skills. Today, the Sea Cub and girls Mermaid programs introduce similar lessons to children every summer, now led by Chad Beeler. Over the years, Chilvers said he has called on his first aid knowledge to assist others when he’s seen a need. “I’ve stepped up several times in my life; everyone should take a course,” he said.